Whether you are a novice or a master ice fisher, everyone can use a little guidance when choosing ice fishing reels. Today, we are going to walk you through the qualities of the best ice fishing reels. In the end, we will reveal our top 5 choices! Spinning: Spinning types are completely out in the open. It is attached below the rod. There are, by far, more spinning ice fishing reels than any other type. Choose this reel if you want the most flexibility, ease of use, and most diverse selection. Spincasting: These are also known as inline reels. Spincasters are attached below the rod and are encased in a protective covering. Baitcasting: Baitcasting rods are the heaviest ice fishing reels, but also offer the most precision. They can be difficult to figure out, but it offers numerous advantages to the advanced fisher-person. Interested in learning more about fishing reels in general? Check out this great write-up. To answer this question, you must know the best application for each reel. To know the best application for each reel, you need to know the size of fish you want to catch. Spinning: Good for beginners ready to move past guideline reels. The spinning variety is also used to catch small fish. Watch Ice Team’s Tim Moore demonstrate the use of spinning reels in ice fishing. Spincasting: Spincasters have a closed design, and are perfect to use in uncooperative weather. They can be used to catch anywhere from small to medium fish. Baitcasting: This type of reel is the most expensive of the 4. However, you have the opportunity to cast farther with the additional line and smoother with fast gears. Baitcasters are good to use for big fish and in deeper water. It is best to buy both the rod and reel together, so they balance each other. If you want to know more about ice fishing rods, check out the buyer's guide from Bass Pro Shops. We're glad you asked! There are four other primary factors to think about when weighing the pros and cons of the best ice fishing reels. Weight: How heavy is the reel? As we mentioned before, baitcasters are by far the heaviest type. 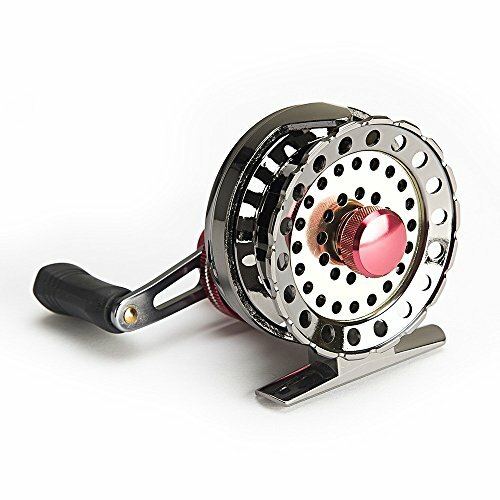 Since ice fishing is a waiting game, we recommend opting for a lighter reel. This goes double if you are walking out to your desired pond or lake! Anti-Freeze Technology: Water and temperatures below zero can make for a gummed up reel. That is why it is important to choose one that has an anti-freeze coating. Typically the spool will have already been coated when you purchase the reel. Friction: The best fishing is smooth fishing. This is where the ball bearings become important. Since these weights are used to counter drag, the friction will be reduced. Therefore, the more, the better! Durability: Last but not least is durability. This is vital to having a successful time ice fishing. The winter elements are unforgiving, and you want a reel that can stand up to wind, ice, low temperatures, and cold water. Unless you have been at ice fishing many years, we recommend going with an inline or a spinning reel. If you are completely new to ice fishing, check out the top tips from Field and Stream. A good real won’t do anything without the right technique. What Type of Bait Do You Plan to Use? There are four primary kinds of bait for ice fishing, and we will cover them here. Grubs are insect larvae. Attach one of these puppies to a tip-up or jiggling rod and you may catch yourself some nice panfish! Some of the most popular grubs used by ice fisher-people are mealworms, mousies, and waxworms. Another type of live bait, baitfish is just like it sounds. Some fish you can use are minnows, smelt, and shiners. These will attract bigger fish such as trout, pike, bass, and walleye. This nonliving bait tends to be smaller than typical freshwater lures. These are best used on smaller areas such as lakes and ponds. To use spoon lures and jigs, you need to know how to use your line to produce fish-like movements! Completely new to ice fishing? Watch this in-depth video from an ice fishing pro about the best kind of bait to use. Of all of the best ice fishing reels, the Black Betty Fishing Reel from 13 Fishing receives our editor’s choice slot. It is easy to use, easy to adjust, and a phenomenal gear ratio of 2:7:1. This reel allows you to pull a whopping 18 inches per crank! Another reason the Black Betty takes the cake is the incredibly strong and durable CNC machined aluminum design. It also features AVA knobs and anti-reverse. The smooth catch is thanks to the carbon drag. You even have the choice of a left-handed or right-handed reel. One of the most impressive features of this reel is the improved frame design. This allows you to use a pencil grip without sacrificing your spool’s rim. If you are interested in larger fish, the 2015 black betty fishing reel can lure them in with the best of them! If you are looking for the best inline ice fishing reel with the best value, look no further than the Eagle Claw Inline Fishing Reel. At less than 6.5 ounces, this inline won’t weigh down your line. Speaking of lines, you can use up to a 10-pound line easy. The Eagle Claw Inline Fishing Reel has a tension knob and utilizes Teflon drag to make for a smooth catch. If you are new to ice fishing, you will appreciate the larger sized spool. It can help a novice keep their lines straight while they are figuring out their technique. If you are left-handed, you can switch the reel for a left hand retrieve. However, we will warn you it takes a bit of effort. Additionally, the handle stays in the same place, and the front of the reel becomes the back. If this sounds confusing, we recommend an easier reel. The Fiblink Ice Fishing Reel is an inline reel that keeps everything important inside. Speaking of important, this reel is easy to use and great for any beginner. It features a spool tension adjustment and release button that make getting acquainted with this sport a breeze! The gear ratio on this product is fantastic at 2:6:1. Even the ball bearings are an impressive 4+1. Remember, the greater the number of bearings the easier the catch. Regarding materials, the star drag system and handle are plastic, the gears are brass, and the shaft is stainless steel. This Fiblink gives you the option of right-handed or left-handed. If you want to crank with your right hand and hold the rod in your left, purchase the right-handed. If you want the rod in your right hand and reel in your left, purchase the left-handed option. The Robson Ice Fishing Reel easily gets the title of smoothest catch. Why? It has the most ball bearings of all five best ice fishing reels on our list! In fact, this product has a full 6+1. That's impressive! What's also impressive is the 2:6:1 gear ratio. Robson focused on smoothness when they created this reel. It features a line cup that ensures each crank feels like the first. This manufacturer did not skimp on the quality of materials either. 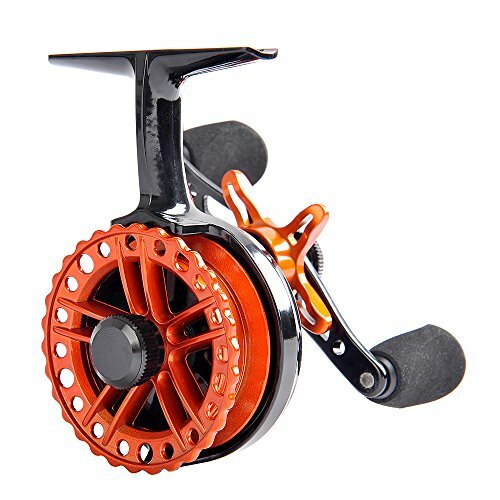 The reel is made of high-density fiber for durability and composite for cold. The Robson Ice Fishing Reel is also one of the quietest around. This is pretty important because fish scare easily. You can even satisfy your saltwater fish cravings due to the anti-corrosive, high-quality material and construction. The best ice fishing reel for freezing temperatures is the Frabill Straight Line 371. It is constructed from high-quality composite materials to ensure your hands won’t freeze in the low temperatures. Even the long stem allows you to wear heavy gloves on the ice. If you are interested in using jigs, the Straight Line 371 gives you a little help with its ultra fine free spool design. There is also an instant anti-reverse feature, and you can adjust the reel to short stem if you feel more comfortable with a more compact sized product. 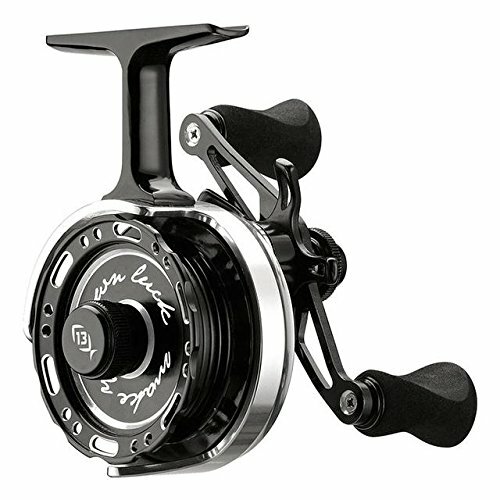 The reel ratio is an incredible 3:7:1, and you can pull 22 inches of line with just one crank of the handle. This is easily the fastest reel on our list. 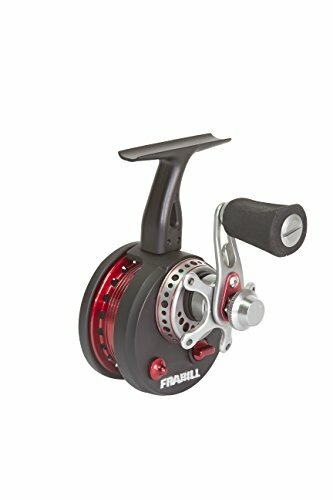 This Frabill also features 5+1 ball bearings for a very easy catch.